Sign up now! or Login to your existing account. Do you need a Corporate Account? It's easy to get started. Pay only when you pass! Choose Your State... Alabama Arizona Arkansas California Colorado Connecticut Delaware District of Columbia Georgia Hawaii Idaho Illinois Indiana Iowa Kansas Kentucky Louisiana Maine Maryland Massachusetts Michigan Minnesota Mississippi Montana Nebraska Nevada New Hampshire New Jersey New Mexico New York North Carolina North Dakota Ohio Oklahoma Oregon Pennsylvania Rhode Island South Carolina South Dakota Tennessee Texas Vermont Virginia Wisconsin Wyoming Don't see your state? Click here. Approved by the American National Standards Institute (ANSI), the eFoodcard Training Program is designed to improve food safety and reduce the risk of foodborne illness. eFoodcard training proves that you are committed to giving your customers the safest and best experience possible. 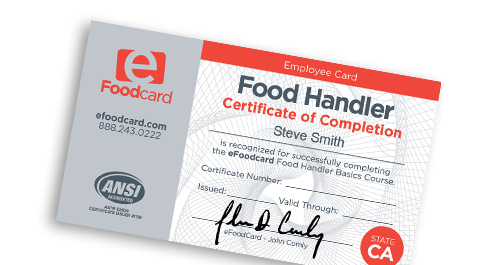 An eFoodcard Corporate Account makes it quick and easy to manage food handler training for your whole staff. Many states require food handler training by law. Check your state's requirements at your local health department. 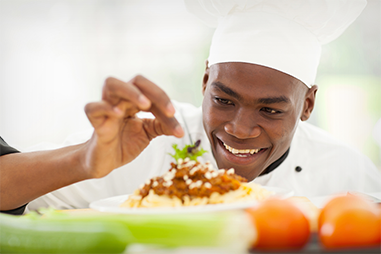 eFoodcard prepares individuals like you for jobs in the foodservice industry and makes you a more valuable employee. eFoodcard.com makes it easy, fast and affordable to become fully trained and receive your food handler card. Need help? Our customer service representatives strive to help you as quickly as possible. For quickest support response time, please send us an email Monday–Friday 9 a.m.–6 p.m. PST. The eFoodcard program is easy to use. 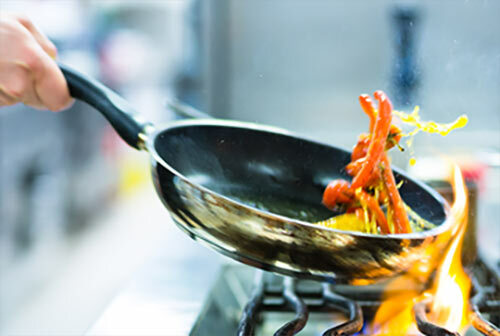 It includes all of the instructional materials that food handlers will need to learn about basic sanitation and food preparation in order to earn a certificate of course completion and food handlers card. All instructional materials and exams are available in English and Spanish, and food handlers pay for the program only when they pass!